For starters, the route we took was the Machame route which I liked as we were able to see different vegetations and the scenery along the way was beautiful. In total the trek lasted six days with 5 days to ascent and one day to descend. I found the first few days ok and not too bad. Altitude sickness hadn’t really begun to kick in and I was just taking everything all in and living in the moment. I was able to get a tent all to myself which I was very happy about as it allowed me space to write my thoughts in my journal during the evening, read and just enjoy my own company. Having said that I do think it was reflective of how I did feel on the trek sometimes; lonely. It’s pretty ironic saying that considering that the group I was with had 36 people, myself included. One thing I will say is that on the mountain you lose all sense of time. Literally. Days run into each other and it is a continuous sequence of waking up, eating, walking, walking some more and then even more walking with breaks interspersed at various times during the day. On average we walked 6hours + each day and on summit night it was definitely 10+ hours of walking. Things started to become really challenging around the 3rd day for me; I began to feel increasingly tired and it’s fair to say that altitude sickness began to creep in. I found myself lagging behind which was incredibly frustrating and totally demoralising. This, coupled with the fact that there were already issues about the pace of the group with quite a few people complaining that our pace was slow. With hindsight this was bound to happen with such a large group that included people of varying abilities, experiences and strength. Either which way, I remember just feeling really angry at myself for being so behind. The journey to Barafu camp has to be one of the challenging points for me; it seemed like a never ending ascent. I literally just had to take it one step at a time and look downwards. I think from this point things started to go a little downhill for me. Altitude sickness hit me in the form of me losing my appetite. Bearing in mind that summit night was later that night it was really poor timing. The porters had to bring my food to the tent and even then I struggled to eat anything and just picked at the food. I remember crashing out and then waking up later on around 2:30am for summit night. It was pretty exciting and the guides and porters helped the group morale by singing songs and just being cheerful in general. To be honest I can’t quite remember much of the beginning of the journey as it was still dark. It was no surprise really that less than halfway I was hungry which left me bitterly regretting not forcing myself to eat more. Snacks and the packed lunch couldn’t really cut it and I was running on pretty much low to non existent energy. Something I wasn’t aware of beforehand is that there are three places at the top where you can summit and which culminate in you getting a certificate. 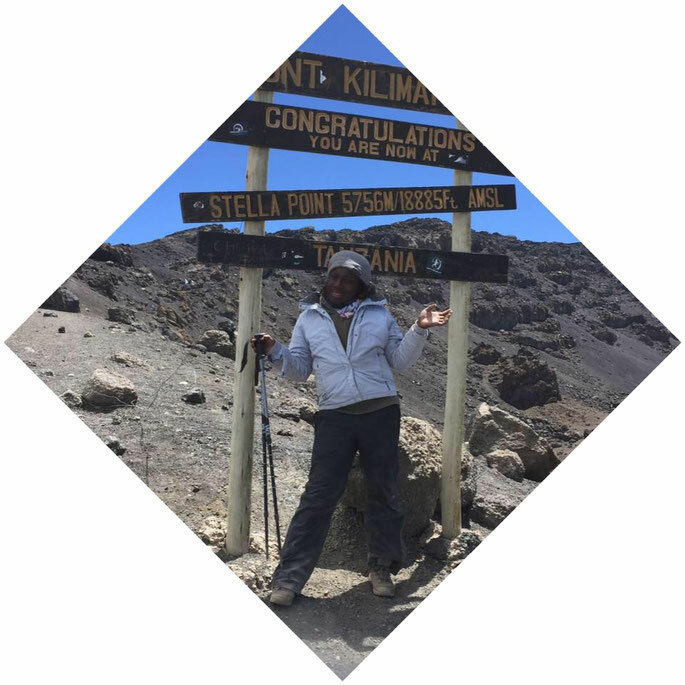 The points are Gilmans Point (5865m), Stella Point (5757m) and Uhuru Peak (5895m) with the latter being the furthest point. The route we took didn’t feature Gilman’s Point so that was always out of the question. It was around 10:00am in the morning and we were still walking and getting close to Stella Point. If I’d thought that the ascent to Barafu Camp was bad this one was much worse and consisted of what felt like going round and round in an everlasting zigzag. An overwhelming sense of fatigue enveloped me and at points I was sleep walking for want of a better word. From Stella Point Uhuru Peak was around an hour away. I remember my guide telling me that at the rate that I was going I wouldn’t make stella point and I remember that infuriating me. Like, do you really think I’d come all this way to not even make it to the top and at least get a certificate? You must be kidding! It became apparent that I wouldn’t be allowed to even try to get to Uhuru Peak (the furthest point) which pissed me off no end especially considering that I was still in the right frame of mind. There was nothing wrong with me and this was confirmed by a guide too. The only thing was that I was slow and that seemed to be reason enough to not go further- apparently. At this point I was too tired to even bother explaining myself and I settled on staying at Stella Point which was still pretty high and still a feat in itself. For me that was the only thing that marred the whole experience for me and to be honest I’d definitely climb Kili again on my own terms which would include climbing with friend(s) or a family member and certainly in a much smaller group. Some experiences are worth being shared and for me this was one such time. There’s something pretty cool about having someone else that you know be in on something special. Having said all of this however what I have learnt about myself during this process is innumerable but I’ll share a few. It was very easy to compare my progress to others and feel inadequate at times especially when I was seriously behind. Doing this only ended up in me feeling frustrated and can be likened to what we tend to do at times in life; compare ourselves to others. All of us have different journeys, detours and destinations in life so why compare where you are in life to someone else? Stay in your lane and appreciate your journey. The grass only looks greener on the other side because you have neglected to water your own. I couldn’t control how altitude sickness would affect me and the times that it would.At best I could try and manage it. Some were more affected than others. I didn’t experience much at the beginning but towards the end it kicked in. Sometimes in life we can’t always control what happens but we can aim to make the best out of whatever life throws at us. The beauty isn’t in the destination but the journey. I really have to stress this point because it is something that really became apparent to me on this climb. There were so many beautiful sights along the way which were breathtaking. Having the clouds as your constant companion was nothing short of cool and it is definitely a sight that will forever remain etched in my mind. At times I’d just stop, pause and take it all in because no photos could ever really capture the beauty of it all. This point is one that I will have to constantly drum into my mind as in life I’m always so eager to get to the destination but struggle to appreciate the journey and the many lessons I learnt along the way. Those are just a few of the things that I learnt and as I was walking down I felt a sense of relief. Unfortunately on the way down I twisted both ankles and managed to twist my left ankle twice. I don’t even know how I was able to get down but it was extremely painful. I remember almost losing the will to continue walking down and thinking that ‘I’m actually going to die walking down’. It may sound ridiculous but it is what it is.I literally had to will myself to try and move and when we got to a point that a car could take me down I was able to get in one and get down. Needless to say I needed to go to hospital after and after a few days the pain subsided.